Ok, so I like to maintain this facade of hardened cynic, but anyone who knows me knows that I have a soft romantic core. 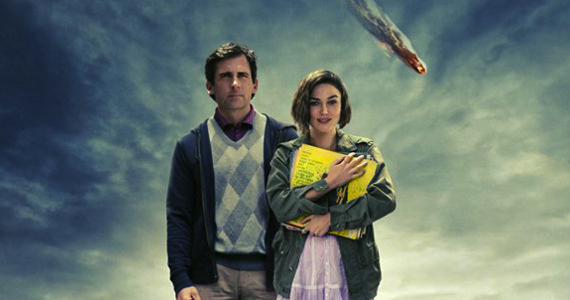 Seeking a Friend for the End of the World is just the kind of film that appeals to me. I have a bit of a thing for apocalyptic settings... I think it raises the stakes of a story. As an asteroid nears Earth, and the end of days in announced, Dodge's (Steve Carell) wife runs away, and he is left contemplating what to do with the rest of his life. He decides to make a trip to visit his high school sweetheart, accompanied by his neighbour Penny (Keira Knightley), who has just missed the last flight back to England, where she hoped to be reunited with her family. As the pair travel together, encountering riots, parties, police officers, and old flames, their connection becomes deeper, and their plans less certain. When watching this film, you have to accept that it is a reasonably 'light' end of the world film. We don't witness the (probably more realistic) panic and anxiety that is prevalent in the characters in Melancholia, for example. Don't get me wrong, there are moments- rioting and a couple of suicides- but on the whole, I would define this as a romantic comedy. Steve Carell's understated performance makes me love him even more (guilty crush). He plays the straight, down the line, insurance salesman, suddenly thrown into a situation where plans are irrelevant. As such, his comic moments are dry and extremely funny, while he still comes across as sincere in the more serious scenes. Played against free spirited Penny, who is flaky and fun, the pair just work together; their on-screen chemistry is great. There are some great comic moments; the last party where children are fed alcohol, allowed to play with fireworks, and the bar where all of the staff are high. These are never too over the top, or ridiculous and they are juxtaposed against some genuinely moving moments; Penny's last call to her family had me shedding a few tears, as did the moment Dodge encounters his estranged Father. By the end of the film, I felt as though I'd gone on a journey with the two characters; I knew more of their histories, of their attitudes, and I really cared about how they spent their final moments. This is the perfect balance of romance and comedy, and well worth a watch. In conclusion: I would spend the end of the world with Steve Carell.